Recent years have seen a steady increase in the number of research reports dealing with full control of phonons. The word "phononics" is slowly entering the scientific vocabulary to indicate a platform in which coherent phonons can be generated, harnessed and detected. In the field of photonics, lasers were a key element to fully enable the technology, but development was not achieved until lasers became easy to build and control. Likewise, despite the so-called "phonon laser" that has been demonstrated in several publications, the high device quality (narrow linewidth) and strict experimental demands of vacuum and low temperature necessary for observable effects or potential applications make it too complex a source for a rapid implementation. A work recently published in Nature's Scientific Reports, headed by the Phononic and Photonic Nanostructures Group led by ICREA Prof. Clivia M. Sotomayor-Torres and with Dr. Daniel Navarro-Urrios as its first author, reports "phonon lasing" in a one-dimensional opto-mechanical crystal in response to an anharmonic modulation of the intracavity radiation pressure force. The latter is a consequence of spontaneous triggering in the optical cavity of a self-pulsing regime, i.e., a stable dynamic competition between thermo-optic (TO) effects and free-carrier-dispersion (FCA). The feedback exerted by the coherent mechanical oscillations on the self-pulsing makes the coupled system a frequency-entrained, self-stabilized oscillator. The wide dynamical frequency tuning of the self-pulsing enables a manifold of frequency-entrained regions associated to the coherent amplification of different mechanical modes up to hundreds of MHz. The self-pulsing dynamics could be readily engineered, enabling the scaling of the phonon lasing frequency up to the tens of GHz. Commonly, the phonon lasing regime in optomechanical systems is achieved by means of dynamical back-action. In this case, compensating intrinsic mechanical losses demands restrictive conditions, and the requirements for the optical and mechanical modes in terms of quality factors and inter-coupling strengths are not easy to fulfill. 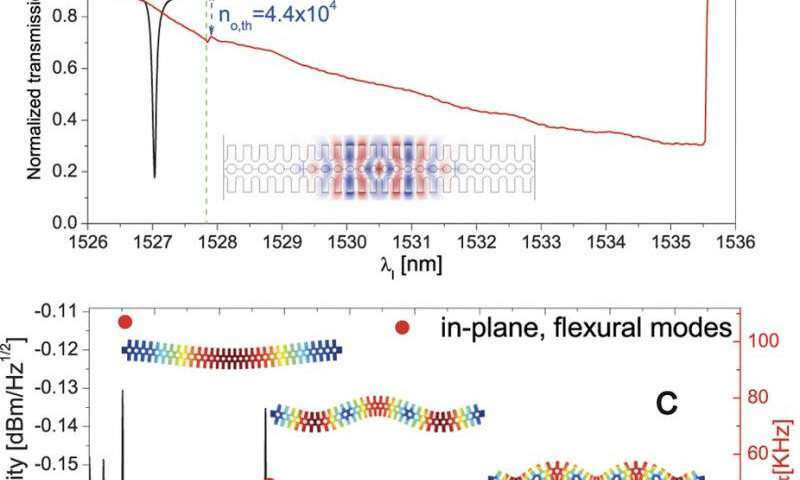 Our findings show a new physical mechanism that allows phonon lasing under far more relaxed configurations; moreover, this opens new research avenues in the field of non-linear opto-mechanics. The system operates at ambient conditions of pressure and temperature in a silicon platform, which enables its exploitation in sensing, intra-chip metrology or time-keeping applications.